You are here: Home / A-Blog / Stunning 85-page Google memo ‘The Good Censor’ leaked to Breitbart. Stunning 85-page Google memo ‘The Good Censor’ leaked to Breitbart. If you are not worried about the power of Google to shape debate and elections according to its leftist political bias, you’re not paying attention. I congratulate Breitbart.com for the scoop, and I urge everyone – I am looking at you, President Trump and Congress – to read and ponder the fate of the Republic unless this company is defanged, most likely by antitrust action, but possibly also via civil courts. Breitbart is mum about how it came to possess the memo, but I do recall that Google is being sued over its dismissal of James Damore for insufficient adherence to its own ideology, and the discovery process in that lawsuit is almost certainly underway. 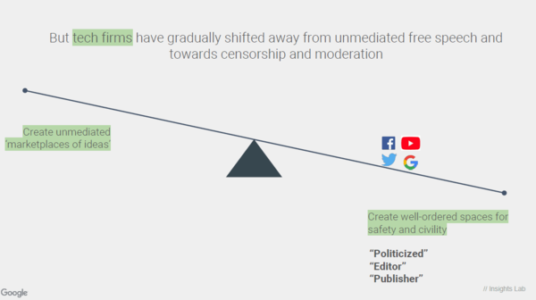 [T]he 85-page briefing, titled “The Good Censor,” admits that Google and other tech platforms now “control the majority of online conversations” and have undertaken a “shift towards censorship” in response to unwelcome political events around the world. The briefing labels the ideal of unfettered free speech on the internet a “utopian narrative” that has been “undermined” by recent global events as well as “bad behavior” on the part of users.